For those of you that watch the financial markets on TV, or read one of the popular newspapers or maybe even visit a financial related website, lately all the news is about the Federal Reserve. Specifically, people are asking, when will the Fed raise interest rates? What impact will higher rates will have on my investments? No doubt, higher rates are an important development. It’s a portfolio mover. We will attempt to provide some insight, share some facts and reassure investors that they should embrace higher rates. The truth is, when the Fed raises interest rates and tightens monetary policy it signals that the economy is stronger and it’s time to return to a more normal interest rate environment. While the initial rate increase may not signal a complete recovery from the depths of the Great Recession, it will signal that we have made it mostly back and it’s time to move forward and to look ahead. Improvement in the overall economy, particularly the housing and labor markets which were devastated the most, will ultimately allow the Federal Reserve to move away from its ultra-easy monetary policy that has fueled the bull market from its low on March 2nd, 2009 (the S&P 500 was at 683) to its current level of 2,075 (as of June 30, 2015) an increase of a whopping 200%. The long overdue normalization of interest rates from these historically low levels will impact investments in many different ways. We saw a preview of this back in May 2013 when the Fed first started discussing tapering its asset purchase program. The initial reaction, dubbed the “Taper Tantrum” where the responses in both the bond and equity markets was very similar; wide spread chaos and increased volatility. Ultimately, rational thinking prevailed and equity markets continued to move higher on fundamentals. We also witnessed a quick, short spike in interest rates and then a return to lower, more rational, levels. The current economic environment is a bit different compared to previous periods of rising rates. In a normal economic cycle, the economy emerges from recession as the Fed cuts rates and subsequent economic growth resumes relatively quickly during a period of low inflation and a helpful monetary policy. 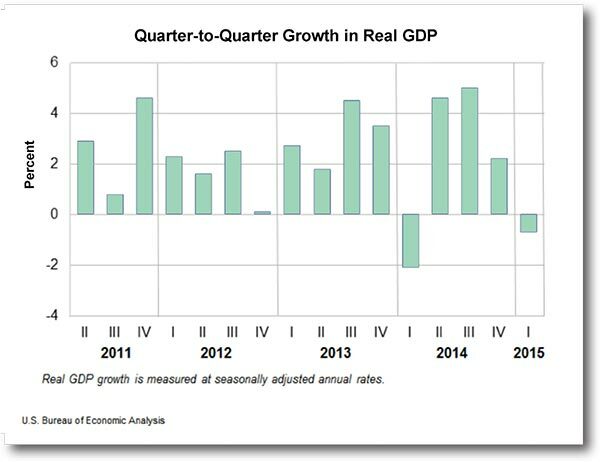 As the economy expands, growth normalizes, economic data is gathered, progress monitored for signs of economic recovery. Finally, the Fed begins increasing rates, usually due to lower unemployment numbers, climbing inflation and accelerating growth. This Fed policy shift divides economic expansions into three stages; early, mid and late. We believe the United States has reached that inflection point between mid and late expansion. Unfortunately, in this recovery, economic growth has been slower than typical recoveries and expansion periods, but it’s gradually improving, unemployment is down and housing has substantially recovered. Despite a few dips, growth could be characterized as slow and steady. Important indicators such as the strengthening labor market, improved housing market and overall consumer sentiment readings suggests that the economy is recovering and will continue to gather momentum in the coming years. At WT Wealth Management, we have said many times, this is a “plow horse economy, not a race horse economy”. The economy isn’t on fire and many American’s still feel the hangover of the Great Recession. However, if it wasn’t for two first quarter GDP disappointments, mostly attributed to horrific weather, we feel we may have already seen our first rate increase, since June of 2006. The other ingredient in the Fed calculations in raising interest rates is inflation. Inflation is more complicated and harder to truly evaluate. You know it when you see it, but then it’s too late. For years, inflation has been virtually nonexistent in the United States, but we believe that is changing, albeit slowly. In our opinion, the sharp and dramatic collapse in oil prices since mid-2014 has put downward pressure on headline and core inflation. We are, however, seeing indications that some inflationary pressures are starting to emerge. The Fed has always been fearful of inflation and we believe that is one reason they would like to get one rate increase in before the end of 2015. Wage inflation is one critical signal for overall inflation. When wages start to climb, consumer spending should increase, which will increase demand for goods and services and start the inflationary pressures. Wages can be measured in several ways, but we believe the best measure is the quarterly Employment Cost Index (ECI). Since the end of the Great Recession, the ECI jumped early and leveled off for several years. That has recently begun changing. The first quarter of 2015 reading showed the ECI climbing at its fastest annual pace in six years. Potentially, an early warning sign to greater inflation pressures in the future. As a result of improving economic growth and potential underlying inflation pressures, we expect the Fed will begin increasing rates, and as a result bond yields will subsequently move higher. The question is when. The United States is hardly in a robust growth mode, and inflationary pressures are only beginning. Unlike previous cycles, the Fed is under no pressure to rein in unsustainable growth or curb mounting inflation. We feel that the U.S. economy is strong enough to withstand higher rates and every attempt should be made to normalized interests and get stock market participants comfortable with a more normalized monitory policy. The unprecedented lowering of the fed funds rate to zero happened as a result of an emergency—the worst financial crisis since the Great Depression. That emergency is long past, and we believe it is time for the Fed to act. Our best guess is that the Fed will begin to increase rates in September 2015 (35% chance). Most experts believe this is their first choice but we wouldn’t be surprised if we didn’t see our first rate increase until December 2015 (15% chance) or January 2016 (50% chance). When the Fed moves, we believe it will do so slowly and methodically. Unfortunately, we think bond yields will overreact and subsequently scare investors with a dramatic drop in bond values. While we feel it will be short lived, it will be unsettling none-the-less. There is a key difference between the current rate environment and previous rate increase cycles—this time the starting point for interest rates is dramatically lower. For the first time in history, the Fed will be raising rates from such a low level and subsequently bond yields are much lower than other rate increase cycles. The fed funds rate has room to move higher before it drags on economic growth. For example, if the Fed enacts three or four 25 basis point rate increases over the coming 12-18 months (a reasonable expectation), the fed funds rate would increase to just 1.0% to 1.25%. We feel this would hardly be punitive on economic growth. During the previous six rate hike cycles, the fed funds rate started at an average level of about 5%. Most importantly for investors, an environment of low and upward moving rates can be a good backdrop for equities. In many cases, equities fared poorly when yields were high and moved higher through rate increases. Not surprisingly, equities performed well when yields were decreasing from elevated levels via rate cuts. Interestingly, stock prices also tended to rise significantly when yields were low and starting to move higher, our current anticipated environment. 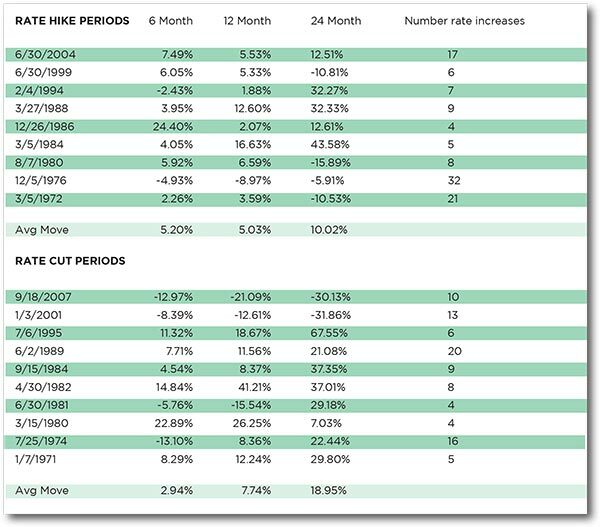 Recently, we went back and review both periods of rate hikes and rate cuts since the early 1970’s. Our findings are outlined below. While there is little doubt that the equity markets prefer falling rate periods, periods where rates increased slowly and steadily over a period of time equity markets performed surprisingly well. While there is always an over-reaction and increased volatility around rate increases, once the dust settles and investors realize the economy is improving, the equity markets perform well over the next 24 months. Presently, the 10-year Treasury yield is around 2.40% (6/30/2015). In the previous nine time periods we examined from the above chart, Treasury yields were much higher when rates had their initial rate increase. During those times, the 10-year yield ranged from 4.6% to as high as 10.3%, with an average starting point of 7.0%. This supports our argument, that rising rates and yields won’t be enough to derail the current bull market since we are starting from such a historically low level. We see several notable developments for investors. The first is that equities will continue to out-perform most other asset classes in the coming months and years. Equity valuations are higher now than a few years ago, but remain more attractive than cash and many areas of the bond market that will suffer from rising rates. A healthy combination of improving economic growth, solid corporate earnings suggests that investors should to continue overweight equities. Large cap equities traditionally out-performed small and mid-caps as we get deeper into the economic expansion phase. Larger companies tend to have more stable earnings trends, and earnings become increasingly important in the second half of economic cycles. Global equities have out-performed U.S. equities when rates are rising in the U.S. Domestic stock prices become more volatile and experience an initial downturn during rate increase cycles. Since many regions of the world are still in a monetary policy easing mode, we expect some near to medium term out performance by markets outside the United States. Recently, we have increased our exposure to Europe and Japan in light of the Eurozone’s and Japan’s quantitative easy policy initiative. However, longer term we continue our favorable long-term view toward U.S. equities. In addition to these broad asset class views, we also have some thoughts about specific sectors of the U.S. equity market. Sector returns tend to be volatile when interest rates move higher, but the 12-month average returns of the S&P 500 sectors following the last six rate hike cycles show some consistent trends. Sectors that tend to exhibit better growth prospects have generally outperformed during periods of rising rates. This gives us a positive view toward the Technology, Financial and Healthcare sectors, which we believe look attractive based on historical trends. We believe a “few” historic trends will not reoccur in this cycle. Energy has historically performed well, but the recent collapse in oil prices combined with slowing growth in China will keep downward pressure on the energy sector for some time. Likewise, the utilities sector appears vulnerable, as valuations for this area appear stretched. We do not expect these typical late cycle sectors plays to out-perform which is very different than past late stage economic cycles. We understand why many investors view the prospect of higher rates with trepidation. The Fed’s highly accommodative monetary policy has been a main contributor to the extremely strong bull market we have enjoyed over the last several years. This policy shift will diminish what has been a strong tailwind. While we don’t believe a fed funds rate of 100 basis points higher will turn into a headwind, it will be an underlying current that will need to be factored into your personal course setting. Nevertheless, we believe equities have room to rise. Historical data we have shown you, shows that it’s not a bad decision to own equities during periods of Fed tightening. In our opinion, it’s a much better place to be than bonds. The coming change in Fed policy is likely to bring additional volatility, and we believe the pace of equity gains will likely recede and maybe even stall for a quarter of two but disciplined investor’s should be rewarded 1-2 years down the road for their patience and discipline. The balance of evidence suggests that stock prices are more likely than not to advance over the coming months and years as the economy continues to grow and mature. As history has proven, rising interest rates tend to be associated with periods of market volatility. We believe this is the most important time to review and know and understand your personal risk tolerance along with understanding exactly how your portfolio may react as interest rates rise so you will not have “statement shock” when you open up the mail. As previously stated, rising rates typically signal accelerating economic growth, a healthier economy and lower unemployment levels. At this point, please go back and review the title to our paper. Rising Rates? Yes Please. WT Wealth Management is a manager of Separately Managed Accounts (SMA). Past performance is no indication of future performance. With SMA’s, performance can vary widely from investor to investor as each portfolio is individually constructed and allocation weightings are determined based on economic and market conditions the day the funds are invested. In a SMA you own individual ETFs and as managers we have the freedom and flexibility to tailor the portfolio to address your personal risk tolerance and investment objectives ñ thus making your account “separate” and distinct from all others we potentially managed. In addition to the normal risks associated with investing, narrowly focused investments, investments in smaller companies, sector ETF’s and investments in single countries typically exhibit higher volatility. International, Emerging Market and Frontier Market ETFs investments may involve risk of capital loss from unfavorable fluctuations in currency values, from differences in generally accepted accounting principles or from economic or political instability that other nation’s experience. Emerging markets involve heightened risks related to the same factors as well as increased volatility and lower trading volume. Bonds, bond funds and bond ETFs will decrease in value as interest rates rise. A portion of a municipal bond fund’s income may be subject to federal or state income taxes or the alternative minimum tax. Capital gains (short and long-term), if any, are subject to capital gains tax. Diversification and asset allocation may not protect against market risk or a loss in your investment. 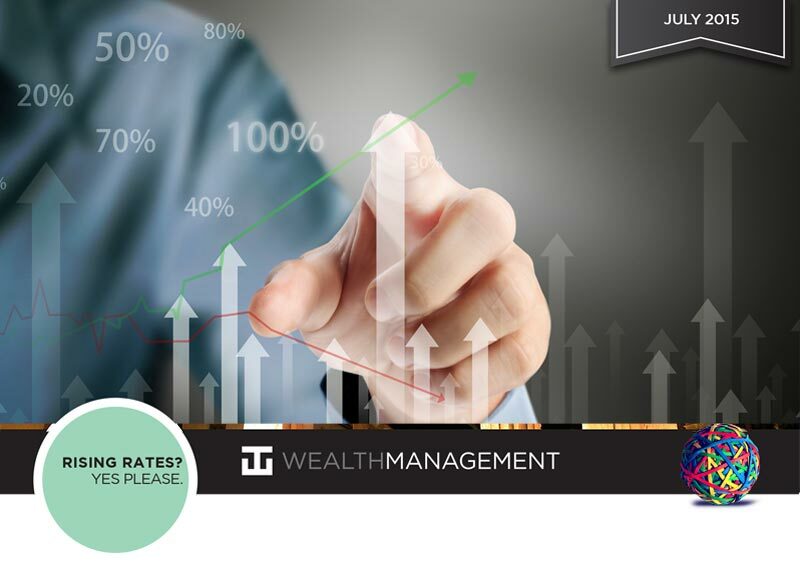 At WT Wealth Management we strongly suggest having a personal financial plan in place before making any investment decisions including understanding your personal risk tolerance and having clearly outlined investment objectives. WT Wealth Management is a registered investment adviser located in Jackson, WY. WT Wealth Management may only transact business in those states in which it is registered, or qualifies for an exemption or exclusion from registration requirements. Any subsequent, direct communication by WT Wealth Management with a prospective client shall be conducted by a representative that is either registered or qualifies for an exemption or exclusion from registration in the state where the prospective client resides. For information pertaining to the registration status of WT Wealth Management, please contact the state securities regulators for those states in which WT Wealth Management maintains a registration filing. A copy of WT Wealth Management’s current written disclosure statement discussing WT Wealth Management’s business operations, services, and fees is available at the SEC’s investment adviser public information website ñ www.adviserinfo.sec.gov or from WT Wealth Management upon written request. WT Wealth Management does not make any representations or warranties as to the accuracy, timeliness, suitability, completeness, or relevance of any information prepared by any unaffiliated third party, whether linked to WT Wealth Management’s web site or incorporated herein, and takes no responsibility therefor. All such information is provided solely for convenience purposes only and all users thereof should be guided accordingly.